Brown adipose tissue (BAT) or brown fat makes up the adipose organ together with white adipose tissue (or white fat). BAT is found in almost all mammals. Classification of brown fat refers to two distinct cell populations with similar functions. The first shares a common embryological origin with muscle cells, found in larger "classic" deposits. The second develops from white adipocytes that are stimulated by the sympathetic nervous system. These adipocytes are found interspersed in white adipose tissue and are also named 'beige' or 'brite' . BAT is especially abundant in newborns and in hibernating mammals. It is also present and metabolically active in adult humans, but its prevalence decreases as humans age. Its primary function is thermoregulation. In addition to heat produced by shivering, BAT produces heat by non-shivering thermogenesis. In contrast to white adipocytes, which contain a single lipid droplet, brown adipocytes contain numerous smaller droplets and a much higher number of (iron-containing) mitochondria, which gives BAT its brown appearance. Brown fat also contains more capillaries than white fat, to supply the tissue with oxygen and nutrients and distribute the produced heat throughout the body. The presence of BAT in adult humans was discovered during FDG-PET scans to detect metastatic cancers. Using these scans and data from human autopsies, several BAT depots have been identified. In infants, BAT depots include, but are not limited to: interscapular, supraclavicular, suprarenal, pericardial, para-aortic and around the pancreas, kidney and trachea. These depots gradually get more white fat-like during adulthood. In adults, the depots that are most often detected in FDG-PET scans are the supraclavicular, paravertebral, mediastinal, para-aortic and suprarenal ones. It remains to be determined whether these depots are 'classical' BAT or beige/brite fat. Brown fat in humans in the scientific and popular literature refers to two cell populations defined by both anatomical location and cellular morphology. Both share presence of small lipid droplets and numerous iron-rich mitochondria, giving the brown appearance. "Classical" brown fat is found in highly vascularized deposits in somewhat consistent anatomical locations, such as between the shoulder blades, surrounding the kidneys, the neck and supraclavicular area, and along the spinal cord. This is the smaller of the two types, and has numerous small lipid droplets. Beige fat is the adrenergically inducible cell type that is dispersed throughout adipose tissue. It has greater variability in lipid droplet size, and a greater proportion of lipid droplets to mitochondria giving it a lighter brown appearance. Brown fat cells come from the middle embryo layer, mesoderm, also the source of myocytes (muscle cells), adipocytes, and chondrocytes (cartilage cells). The classic population of brown fat cells and muscle cells both seem to be derived from the same population of stem cells in the mesoderm, paraxial mesoderm. Both have the intrinsic capacity to activate the myogenic factor 5 (Myf5) promoter, a trait only associated with myocytes and this population of brown fat. Progenitors of traditional white fat cells and adrenergically induced brown fat do not have the capacity to activate the Myf5 promoter. Both adipocytes and brown adipocyte may be derived from pericytes, the cells which surround the blood vessels that run through white fat tissue. Notably, this is not the same as the presence of Myf5 protein, which is involved in the development of many tissues. Additionally, muscle cells that were cultured with the transcription factor PRDM16 were converted into brown fat cells, and brown fat cells without PRDM16 were converted into muscle cells. The mitochondria in a eukaryotic cell utilize fuels to produce energy in the form of adenosine triphosphate (ATP). This process involves storing energy as a proton gradient, also known as the proton motive force (PMF), across the mitochondrial inner membrane. This energy is used to synthesize ATP when the protons flow across the membrane (down their concentration gradient) through the ATP synthase enzyme; this is known as chemiosmosis. In endotherms, body heat is maintained by signaling the mitochondria to allow protons to run back along the gradient without producing ATP (proton leak). This can occur since an alternative return route for the protons exists through an uncoupling protein in the inner membrane. This protein, known as uncoupling protein 1 (thermogenin), facilitates the return of the protons after they have been actively pumped out of the mitochondria by the electron transport chain. This alternative route for protons uncouples oxidative phosphorylation and the energy in the PMF is instead released as heat. To some degree, all cells of endotherms give off heat, especially when body temperature is below a regulatory threshold. However, brown adipose tissue is highly specialized for this non-shivering thermogenesis. First, each cell has a higher number of mitochondria compared to more typical cells. Second, these mitochondria have a higher-than-normal concentration of thermogenin in the inner membrane. The nervous system is not fully developed and does not respond quickly and/or properly to cold (e.g., by contracting blood vessels in and just below the skin: vasoconstriction). Heat production in brown fat provides an infant with an alternative means of heat regulation. Micrograph of a hibernoma, a benign tumour thought to arise from brown fat (haematoxylin and eosin stain). It was believed that after infants grow up, most of the mitochondria (which are responsible for the brown color) in brown adipose tissue disappear, and the tissue becomes similar in function and appearance to white fat. In rare cases, brown fat continues to grow, rather than involuting; this leads to a tumour known as a hibernoma. More recent research has shown that brown fat is related not to white fat, but to skeletal muscle. Studies using positron emission tomography scanning of adult humans have shown that BAT is still present in most adults in the upper chest and neck (especially paravertebrally). The remaining deposits become more visible (increasing tracer uptake, that is, more metabolically active) with cold exposure, and less visible if an adrenergic beta blocker is given before the scan. These discoveries could lead to new methods of weight loss, since brown fat takes calories from normal fat and burns it. Scientists have been able to stimulate brown fat growth in mice. One study of APOE knock out mice showed cold exposure could promote atherosclerotic plaque growth and instability when study mice were subjected to sustained low temperatures of 4 °C for 8 weeks, which may cause a stress condition that shows rapid forced change rather than a safe acclimatisation that can be used to understand the potential in adult humans during modest reductions of ambient temperature by just 5 to 10 °C. Furthermore, several newer studies have documented the substantial benefits of cold exposure in multiple species including humans, for example researchers concluded that "activation of BAT is a powerful therapeutic avenue to ameliorate hyperlipidaemia and protect from atherosclerosis" and that brown fat activation reduces plasma triglyceride and cholesterol levels and attenuates diet-induced atherosclerosis development. Long term studies of adult humans are needed to establish a balance of benefit and risk, in combination with historical research of living conditions of recent human generations prior to the current increase of poor health related to excessive accumulation of white fat. Pharmacological approaches using β3-adrenoceptor agonists have been shown to enhance glucose metabolic activity of brown adipose tissue in rodents. BAT activation improves glucose homeostasis and insulin sensitivity in humans suggesting that anyone with impaired insulin function might benefit from BAT activation, however there is broader application given research showing even mildly elevated blood glucose in healthy non-diabetic humans is associated with damage over time of many organs such as eyes, brain, tendons, endothelial/cardiovascular system and brain, and results in higher levels of damaging advanced glycation end products. BAT activation may play an important role in bone health and bone density. BAT activation though cold exposure increases adiponectin levels, just two hours of cold exposure resulted in a 70% increase in circulating adiponectin in adult men. Centenarians (both men and women) and their offspring have been found to have genetics that boost adiponectin, and they have higher circulating adiponectin, suggesting a link between longevity and adiponectin production In addition, high concentrations of plasma adiponectin in centenarians was associated with favorable metabolic indicators, and with lower levels of C-reactive protein and E-selectin. Fibroblast Growth Factor 21 Production (FGF-21) has been documented as a pathway to longevity. BAT activation though cold exposure up-regulates circulating fibroblast growth factor 21 (FGF21) in humans by 37%. FGF21 improves insulin sensitivity and glucose metabolism which may partially explain its longevity promoting benefits. Cold exposure increases SIRT1 phosphorylation/activity in both skeletal muscle and BAT, increasing thermogenesis and insulin sensitivity. Elevated SIRT1 levels in people are associated with increased human longevity. SIRT1 (and the other sirtuins) have many metabolic effects, but an important one for improving health and longevity is the fact that SIRT1 increases insulin sensitivity and glucose control in skeletal muscles, triggers the browning of white fat and increases BAT activity. The interscapular brown adipose tissue is commonly and inappropriately referred to as the hibernating gland. Whilst believed by many to be a type of gland, it is actually a collection of adipose tissues lying between the scapulae of rodentine mammals. Composed of brown adipose tissue and divided into two lobes, it resembles a primitive gland, regulating the output of a variety of hormones. The function of the tissue appears to be involved in the storage of medium to small lipid chains for consumption during hibernation. The smaller lipid structure allowing for a more rapid path of energy production than glycolysis. In studies where the interscapular brown adipose tissue of rats were lesioned, it was demonstrated that the rats had difficulty regulating their normal body-weight. The longest-lived small mammals: grey squirrels (24 yrs), bats (30 yrs), and naked mole rats (32 yrs), all have remarkably high levels of BAT and BAT activity. Furthermore, in animal species that span a wide range of latitudes, the within-species longevity is correlated with how far north (or south, in the southern hemisphere) an individual lives suggesting that cooler environments lead to increased BAT activation and increased lifespan across a wide range of species. ↑ Cinti S (2005). "The adipose organ". Prostaglandins Leukot Essent Fatty Acids. 73 (1): 9–15. doi:10.1016/j.plefa.2005.04.010. PMID 15936182. 1 2 3 4 Enerbäck S (2009). "The origins of brown adipose tissue". New England Journal of Medicine. 360 (19): 2021–2023. doi:10.1056/NEJMcibr0809610. PMID 19420373. ↑ Petrovic N, Walden TB, Shabalina IG, Timmons JA, Cannon B, Nedergaard J (2010). "Chronic peroxisome proliferator-activated receptor gamma (PPARgamma) activation of epididymally derived white adipocyte cultures reveals a population of thermogenically competent, UCP1-containing adipocytes molecularly distinct from classic brown adipocytes.". J Biol Chem. 285 (10): 7153–64. doi:10.1074/jbc.M109.053942. PMC 2844165 . PMID 20028987. ↑ Wu J, Boström P, Sparks LM, Ye L, Choi JH, Giang AH, Khandekar M, Virtanen KA, Nuutila P, Schaart G, Huang K, Tu H, van Marken Lichtenbelt WD, Hoeks J, Enerbäck S, Schrauwen P, Spiegelman BM (2012). "Beige adipocytes are a distinct type of thermogenic fat cell in mouse and human.". Cell. 150 (2): 366–76. doi:10.1016/j.cell.2012.05.016. PMC 3402601 . PMID 22796012. ↑ Gesta S, Tseng YH, Kahn CR (October 2007). "Developmental origin of fat: tracking obesity to its source". Cell. 131 (2): 242–56. doi:10.1016/j.cell.2007.10.004. PMID 17956727. ↑ Nedergaard J, Bengtsson T, Cannon B (2007). "Unexpected evidence for active brown adipose tissue in adult humans.". Am J Physiol Endocrinol Metab. 293 (2): E444–52. doi:10.1152/ajpendo.00691.2006. PMID 17473055. ↑ Saito M, Okamatsu-Ogura Y, Matsushita M, Watanabe K, Yoneshiro T, Nio-Kobayashi J, Iwanaga T, Miyagawa M, Kameya T, Nakada K, Kawai Y, Tsujisaki M (2009). "High incidence of metabolically active brown adipose tissue in healthy adult humans: effects of cold exposure and adiposity.". Diabetes. 58 (7): 1526–31. doi:10.2337/db09-0530. PMC 2699872 . PMID 19401428. ↑ Graja A, Schulz TJ (2015). "Mechanisms of aging-related impairment of brown adipocyte development and function.". Gerontology. 61 (3): 211–7. doi:10.1159/000366557. PMID 25531079. ↑ Cohade C, Osman M, Pannu HK, Wahl RL (2003). 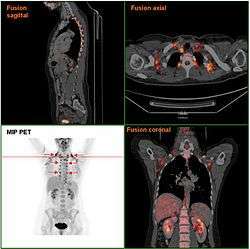 "Uptake in supraclavicular area fat ("USA-Fat"): description on 18F-FDG PET/CT.". J Nucl Med. 44 (2): 170–6. PMID 12571205. ↑ Yeung HW, Grewal RK, Gonen M, Schöder H, Larson SM (2003). "Patterns of (18)F-FDG uptake in adipose tissue and muscle: a potential source of false-positives for PET.". J Nucl Med. 44 (11): 1789–96. PMID 14602861. ↑ Heaton JM (1972). "The distribution of brown adipose tissue in the human.". J Anat. 112 (Pt 1): 35–9. PMC 1271341 . PMID 5086212. ↑ van Marken Lichtenbelt WD, Vanhommerig JW, Smulders NM, Drossaerts JM, Kemerink GJ, Bouvy ND, Schrauwen P, Teule GJ (2009). "Cold-activated brown adipose tissue in healthy men.". N Engl J Med. 360 (15): 1500–8. doi:10.1056/NEJMoa0808718. PMID 19357405. ↑ Shinoda K, Luijten IH, Hasegawa Y, Hong H, Sonne SB, Kim M, Xue R, Chondronikola M, Cypess AM, Tseng YH, Nedergaard J, Sidossis LS, Kajimura S (2015). "Genetic and functional characterization of clonally derived adult human brown adipocytes.". Nat Med. 21 (4): 389–94. doi:10.1038/nm.3819. PMC 4427356 . PMID 25774848. ↑ Lidell ME, Betz MJ, Enerbäck S (2014). "Two types of brown adipose tissue in humans.". Adipocyte. 3 (1): 63–6. doi:10.4161/adip.26896. PMC 3917936 . PMID 24575372. ↑ Cedikova, Miroslava; Kripnerová, Michaela; Dvorakova, Jana; Pitule, Pavel; Grundmanova, Martina; Babuska, Vaclav; Mullerova, Dana; Kuncova, Jitka (2016-03-17). "Mitochondria in White, Brown, and Beige Adipocytes". Stem Cells International. 2016: 1–11. doi:10.1155/2016/6067349. PMC 4814709 . PMID 27073398. ↑ Haldar, Malay; Karan, Goutam; Tvrdik, Petr; Capecchi, Mario R. (2008-03-11). "Two Cell Lineages, myf5 and myf5-Independent, Participate in Mouse Skeletal Myogenesis". Developmental Cell. 14 (3): 437–445. doi:10.1016/j.devcel.2008.01.002. ISSN 1534-5807. PMC 2917991 . PMID 18331721. ↑ Nedergaard J, Bengtsson T, Cannon B (August 2007). "Unexpected evidence for active brown adipose tissue in adult humans". American Journal of Physiology. Endocrinology and Metabolism. 293 (2): E444–52. doi:10.1152/ajpendo.00691.2006. PMID 17473055. ↑ Francesco S. Celi (9 April 2009). "Brown adipose tissue—when it pays to be inefficient". New England Journal of Medicine. 360 (15): 1553–6. doi:10.1056/NEJMe0900466. PMC 2753374 . PMID 19357412. ↑ Kolata, Gina (8 April 2009). "Calorie-burning fat? Studies say you have it". The New York Times. p. A1. ↑ Shingo Kajimura (27 August 2009). "Initiation of myoblast/brown fat switch through a PRDM16-C/EBP-β transcriptional complex". Nature. 460: 1154–1158. doi:10.1038/nature08262. PMC 2754867 . PMID 19641492. ↑ Kajimura S; Seale, Patrick; Kubota, Kazuishi; Lunsford, Elaine; Frangioni, John V.; Gygi, Steven P.; Spiegelman, Bruce M.; et al. (August 2009). "Initiation of myoblast/brown fat switch through a PRDM16-C/EBP-β transcriptional complex". Nature. 460 (7259): 1154–8. doi:10.1038/nature08262. PMC 2754867 . PMID 19641492. ↑ "'Good fat' could help manage type 2 diabetes". monash.edu. Monash University. Retrieved 24 November 2014. ↑ Dong, Mei; Yang, Xiaoyan; Lim, Sharon; Cao, Ziquan; Honek, Jennifer; Lu, Huixia; Zhang, Cheng; et al. (2 July 2013). "Cold exposure promotes atherosclerotic plaque growth and instability via UCP1-dependent lipolysis" (Short article). Cell Metabolism. 18: 118–129. doi:10.1016/j.cmet.2013.06.003. ↑ Berbée, Jimmy F. P.; Boon, Mariëtte R.; Khedoe, P. Padmini S. J.; Bartelt, Alexander; Schlein, Christian; Worthmann, Anna; Kooijman, Sander; Hoeke, Geerte; Mol, Isabel M. (2015-01-01). "Brown fat activation reduces hypercholesterolaemia and protects from atherosclerosis development". Nature Communications. 6: 6356. doi:10.1038/ncomms7356. ISSN 2041-1723. PMC 4366535 . PMID 25754609. ↑ Hoeke G, Kooijman S, Boon MR, Rensen PC, Berbée JF (8 January 2016). "Role of Brown Fat in Lipoprotein Metabolism and Atherosclerosis.". Circ Res. 118: 173–82. doi:10.1161/CIRCRESAHA.115.306647. PMID 26837747. ↑ Mirbolooki, M. R.; Constantinescu, C. C.; Pan, M. L.; Mukherjee, J (2011). "Quantitative assessment of brown adipose tissue metabolic activity and volume using 18F-FDG PET/CT and β3-adrenergic receptor activation". EJNMMI Research. 1 (1): 30. doi:10.1186/2191-219X-1-30. PMC 3250993 . PMID 22214183. ↑ Mirbolooki, M. R.; Schade, K. N.; Constantinescu, C. C.; Pan, M. L.; Mukherjee, J (2015). "Enhancement of (18) F-fluorodeoxyglucose metabolism in rat brain frontal cortex using a β3 adrenoceptor agonist". Synapse. 69 (2): 96–8. doi:10.1002/syn.21789. PMC 4275345 . PMID 25347981. ↑ Mirbolooki, M. R.; Upadhyay, S. K.; Constantinescu, C. C.; Pan, M. L.; Mukherjee, J (2014). "Adrenergic pathway activation enhances brown adipose tissue metabolism: A ¹⁸FFDG PET/CT study in mice". Nuclear Medicine and Biology. 41 (1): 10–6. doi:10.1016/j.nucmedbio.2013.08.009. PMC 3840120 . PMID 24090673. ↑ Stanford, Kristin I.; Middelbeek, Roeland J.W. ; Townsend, Kristy L.; An, Ding; Nygaard, Eva B.; Hitchcox, Kristen M.; Markan, Kathleen R.; Nakano, Kazuhiro; Hirshman, Michael F. (2013-01-02). "Brown adipose tissue regulates glucose homeostasis and insulin sensitivity". The Journal of Clinical Investigation. 123 (1): 215–223. doi:10.1172/JCI62308. ISSN 0021-9738. PMC 3533266 . PMID 23221344. ↑ Chondronikola, Maria; Volpi, Elena; Børsheim, Elisabet; Porter, Craig; Annamalai, Palam; Enerbäck, Sven; Lidell, Martin E.; Saraf, Manish K.; Labbe, Sebastien M. (2014-07-23). "Brown Adipose Tissue Improves Whole Body Glucose Homeostasis and Insulin Sensitivity in Humans". Diabetes: DB_140746. doi:10.2337/db14-0746. ISSN 0012-1797. PMC 4238005 . PMID 25056438. ↑ Bjørnholt, J. V.; Erikssen, G.; Aaser, E.; Sandvik, L.; Nitter-Hauge, S.; Jervell, J.; Erikssen, J.; Thaulow, E. (1999-01-01). "Fasting blood glucose: an underestimated risk factor for cardiovascular death. Results from a 22-year follow-up of healthy nondiabetic men". Diabetes Care. 22 (1): 45–49. ISSN 0149-5992. PMID 10333902. ↑ Snedeker, Jess G. (2016-01-01). "How High Glucose Levels Affect Tendon Homeostasis". Advances in Experimental Medicine and Biology. 920: 191–198. doi:10.1007/978-3-319-33943-6_18. ISSN 0065-2598. PMID 27535261. ↑ Cherbuin, Nicolas; Sachdev, Perminder; Anstey, Kaarin J. (2012-09-04). "Higher normal fasting plasma glucose is associated with hippocampal atrophy The PATH Study". Neurology. 79 (10): 1019–1026. doi:10.1212/WNL.0b013e31826846de. ISSN 0028-3878. PMID 22946113. ↑ Devlin, Maureen J. (2015-02-01). "The "Skinny" on brown fat, obesity, and bone". American Journal of Physical Anthropology. 156: 98–115. doi:10.1002/ajpa.22661. ISSN 1096-8644. ↑ Lee, P.; Brychta, R.J.; Collins, M.T. ; Linderman, J.; Smith, S.; Herscovitch, P.; Millo, C.; Chen, K.Y. ; Celi, F.S. (2013-04-01). "Cold-activated brown adipose tissue is an independent predictor of higher bone mineral density in women". Osteoporosis International. 24 (4): 1513–1518. doi:10.1007/s00198-012-2110-y. ISSN 0937-941X. ↑ Imbeault, Pascal; Dépault, Isabelle; Haman, François (2009-04-01). "Cold exposure increases adiponectin levels in men". Metabolism: Clinical and Experimental. 58 (4): 552–559. doi:10.1016/j.metabol.2008.11.017. ISSN 1532-8600. PMID 19303978. ↑ Atzmon, Gil; Pollin, Toni I.; Crandall, Jill; Tanner, Keith; Schechter, Clyde B.; Scherer, Philipp E.; Rincon, Marielisa; Siegel, Glenn; Katz, Micol (2008-05-01). "Adiponectin levels and genotype: a potential regulator of life span in humans". The Journals of Gerontology. Series A, Biological Sciences and Medical Sciences. 63 (5): 447–453. ISSN 1079-5006. PMC 4507412 . PMID 18511746. ↑ Arai, Yasumichi; Nakazawa, Susumu; Kojima, Toshio; Takayama, Michiyo; Ebihara, Yoshinori; Shimizu, Ken-ichirou; Yamamura, Ken; Homma, Satoki; Osono, Yasunori (2006-02-27). "High adiponectin concentration and its role for longevity in female centenarians". Geriatrics and Gerontology International. 6 (1): 32–39. doi:10.1111/j.1447-0594.2006.00304.x. ISSN 1447-0594. ↑ Zhang, Yuan; Xie, Yang; Berglund, Eric D.; Coate, Katie Colbert; He, Tian Teng; Katafuchi, Takeshi; Xiao, Guanghua; Potthoff, Matthew J.; Wei, Wei (2012-01-01). "The starvation hormone, fibroblast growth factor-21, extends lifespan in mice". eLife. 1: e00065. doi:10.7554/eLife.00065. ISSN 2050-084X. PMC 3466591 . PMID 23066506. 1 2 Lee, Paul; Linderman, Joyce D.; Smith, Sheila; Brychta, Robert J.; Wang, Juan; Idelson, Christopher; Perron, Rachel M.; Werner, Charlotte D.; Phan, Giao Q. (2014-02-04). "Irisin and FGF21 are cold-induced endocrine activators of brown fat function in humans". Cell Metabolism. 19 (2): 302–309. doi:10.1016/j.cmet.2013.12.017. ISSN 1932-7420. PMID 24506871. ↑ Camporez, João Paulo G.; Jornayvaz, François R.; Petersen, Max C.; Pesta, Dominik; Guigni, Blas A.; Serr, Julie; Zhang, Dongyan; Kahn, Mario; Samuel, Varman T. (2013-09-01). "Cellular mechanisms by which FGF21 improves insulin sensitivity in male mice". Endocrinology. 154 (9): 3099–3109. doi:10.1210/en.2013-1191. ISSN 1945-7170. PMC 3749479 . PMID 23766126. ↑ Colaianni, Graziana; Cuscito, Concetta; Mongelli, Teresa; Pignataro, Paolo; Buccoliero, Cinzia; Liu, Peng; Lu, Ping; Sartini, Loris; Di Comite, Mariasevera (2015-09-29). "The myokine irisin increases cortical bone mass". Proceedings of the National Academy of Sciences of the United States of America. 112 (39): 12157–12162. doi:10.1073/pnas.1516622112. ISSN 1091-6490. PMC 4593131 . PMID 26374841. ↑ Harmon, Katherine. "Newly Discovered Hormone Boosts Effects of Exercise, Could Help Fend Off Diabetes". Retrieved 2016-09-02. ↑ Emanuele, Enzo; Minoretti, Piercarlo; Pareja-Galeano, Helios; Sanchis-Gomar, Fabian; Garatachea, Nuria; Lucia, Alejandro (2014-09-01). "Serum irisin levels, precocious myocardial infarction, and healthy exceptional longevity". The American Journal of Medicine. 127 (9): 888–890. doi:10.1016/j.amjmed.2014.04.025. ISSN 1555-7162. PMID 24813865. ↑ Gerhart-Hines, Zachary; Dominy, John E.; Blättler, Sharon M.; Jedrychowski, Mark P.; Banks, Alexander S.; Lim, Ji-Hong; Chim, Helen; Gygi, Steven P.; Puigserver, Pere (2011-12-23). "The cAMP/PKA pathway rapidly activates SIRT1 to promote fatty acid oxidation independently of changes in NAD+". Molecular Cell. 44 (6): 851–863. doi:10.1016/j.molcel.2011.12.005. ISSN 1097-2765. PMC 3331675 . PMID 22195961. ↑ Kilic, Ulkan; Gok, Ozlem; Erenberk, Ufuk; Dundaroz, Mehmet Rusen; Torun, Emel; Kucukardali, Yasar; Elibol-Can, Birsen; Uysal, Omer; Dundar, Tolga (2015-01-01). "A remarkable age-related increase in SIRT1 protein expression against oxidative stress in elderly: SIRT1 gene variants and longevity in human". PloS One. 10 (3): e0117954. doi:10.1371/journal.pone.0117954. ISSN 1932-6203. PMC 4365019 . PMID 25785999. ↑ Schenk, Simon; McCurdy, Carrie E.; Philp, Andrew; Chen, Mark Z.; Holliday, Michael J.; Bandyopadhyay, Gautum K.; Osborn, Olivia; Baar, Keith; Olefsky, Jerrold M. (2011-11-01). "Sirt1 enhances skeletal muscle insulin sensitivity in mice during caloric restriction". The Journal of Clinical Investigation. 121 (11): 4281–4288. doi:10.1172/JCI58554. ISSN 1558-8238. PMC 3204844 . PMID 21985785. ↑ Qiang, Li; Wang, Liheng; Kon, Ning; Zhao, Wenhui; Lee, Sangkyu; Zhang, Yiying; Rosenbaum, Michael; Zhao, Yingming; Gu, Wei (2012-08-03). "Brown remodeling of white adipose tissue by SirT1-dependent deacetylation of Pparγ". Cell. 150 (3): 620–632. doi:10.1016/j.cell.2012.06.027. ISSN 1097-4172. PMC 3413172 . PMID 22863012. ↑ Boutant, Marie; Joffraud, Magali; Kulkarni, Sameer S.; García-Casarrubios, Ester; García-Roves, Pablo M.; Ratajczak, Joanna; Fernández-Marcos, Pablo J.; Valverde, Angela M.; Serrano, Manuel (2015-02-01). "SIRT1 enhances glucose tolerance by potentiating brown adipose tissue function". Molecular Metabolism. 4 (2): 118–131. doi:10.1016/j.molmet.2014.12.008. ISSN 2212-8778. PMC 4314542 . PMID 25685699. ↑ Elroy F. Sheldon (1924). "The so-called hibernating gland in mammals: A form of adipose tissue". The Anatomical Record. 28 (5): 331–347. doi:10.1002/ar.1090280502. ↑ Laura Austgen (2002-08-08). "Brown adipose tissue". Retrieved 2009-02-04. ↑ Nnodim, J. O. & Lever, J. D. (1985-12-01). "The pre- and postnatal development and ageing of interscapular brown adipose tissue in the rat". Anatomy and Embryology. 173 (2): 215–223. doi:10.1007/BF00316302. PMID 4083523. ↑ Wassermann, F. (1965). "5: Adipose Tissue". In Renold, A. E.; Cahill, G. F. Jr. Handbook of Physiology. Washington: American Physiological Society. pp. 87–100. 1 2 E. Connolly; R. D. Morriseyt; J. A. Carnie (1982). "The effect of interscapular brown adipose tissue removal on body-weight and cold response in the mouse". The British Journal of Nutrition. 47 (3): 653–658. doi:10.1079/BJN19820077. PMID 6282304. ↑ Keil, Gerald; Cummings, Elizabeth; de Magalhães, João Pedro (2015-08-01). "Being cool: how body temperature influences ageing and longevity". Biogerontology. 16 (4): 383–397. doi:10.1007/s10522-015-9571-2. ISSN 1573-6768. PMC 4486781 . PMID 25832892. ↑ Ducharme, Michel B.; Larochelle, Jacques; Richard, Denis (1989-01-01). "Thermogenic Capacity in Gray and Black Morphs of the Gray Squirrel, Sciurus carolinensis". Physiological Zoology. 62 (6): 1273–1292. JSTOR 30156213. ↑ Woodley, Ryan; Buffenstein, Rochelle (2002-11-01). "Thermogenic changes with chronic cold exposure in the naked mole-rat (Heterocephalus glaber)". Comparative Biochemistry and Physiology. Part A, Molecular & Integrative Physiology. 133 (3): 827–834. ISSN 1095-6433. PMID 12443938. ↑ DALY, T. JOSEPH M.; WILLIAMS, LAURA A.; BUFFENSTEIN, ROCHELLE (1997-04-01). "Catecholaminergic innervation of interscapular brown adipose tissue in the naked mole-rat (Heterocephalus glaber)". Journal of Anatomy. 190 (Pt 3): 321–326. doi:10.1046/j.1469-7580.1997.19030321.x. ISSN 0021-8782. PMC 1467613 . PMID 9147219. ↑ Kim, Eun Bae; Fang, Xiaodong; Fushan, Alexey A.; Huang, Zhiyong; Lobanov, Alexei V.; Han, Lijuan; Marino, Stefano M.; Sun, Xiaoqing; Turanov, Anton A. (2011-10-12). "Genome sequencing reveals insights into physiology and longevity of the naked mole rat". Nature. 479 (7372): 223–227. doi:10.1038/nature10533. ISSN 0028-0836. PMC 3319411 . PMID 21993625. ↑ KUNZ, Thomas H.; WRAZEN, John A.; BURNETT, Christopher D. (1998-01-01). "Changes in body mass and fat reserves in prehibernating little brown bats (Myotis lucifugus)". Écoscience. 5 (1): 8–17. JSTOR 42900766. ↑ Munch, Stephan B.; Salinas, Santiago (2009-08-18). "Latitudinal variation in lifespan within species is explained by the metabolic theory of ecology". Proceedings of the National Academy of Sciences of the United States of America. 106 (33): 13860–13864. doi:10.1073/pnas.0900300106. ISSN 0027-8424. PMC 2728985 . PMID 19666552.